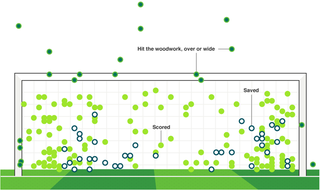 With the tournament starting next week, the BBC has put together a neat little guide on "what makes the perfect World Cup shootout penalty." The graphic above—showing the location and result of all 204 World Cup shootout attempts—is just one of several neat visuals; go check them all out. 144 of the 204 attempts were scores (71 percent), 41 were saved by the keeper (20 percent), and the remaining 19 were straight-up misses (9 percent). The shooters seemed to aim left and right fairly equally, which is in keeping with findings that elite players are good at randomizing their shots (same in other sports). The keepers, on the other hand, seem to have more range diving to their left, although the sample of saves is small. Why Is T.J. Oshie So Good In The Shootout? Unfortunately, the BBC graphic doesn't let you reference which shot is which, because we really want to know which guys booted those field goals.